WWTA SEWER SPILL! Raw, Chunky & Gross! WWTA Track Record is NOT good! A NEW spill sewage all over the Golf Course flowing into Wells Branch Creek and the Lake (Raw SEWAGE). Do we really think WWTA can manage a sewer plant in a PROTECTED WETLANDS area in OOLTEWAH, HELL NO! A couple of hundred homeowners gathered Thursday night to start planning their counteroffensive against a planned sewage treatment plant on Mahan Gap Road. The sanctuary of Meadowview Baptist Church was full and a few people leaned against the walls while Brent Smith, of North Heron Bay, and Dean Morehouse, whose property adjoins the proposed plant site, briefed them on steps so far and on what needs to happen next. Many in the crowd had attended public hearings by the Hamilton County Water and Wastewater Treatment Authority, which says the $45 million plant would provide needed treatment capacity for the rapidly growing northeast portion of Hamilton County. Furious homeowners in the North Ooltewah area don’t dispute the need for the plant but want it placed somewhere other than their communities. 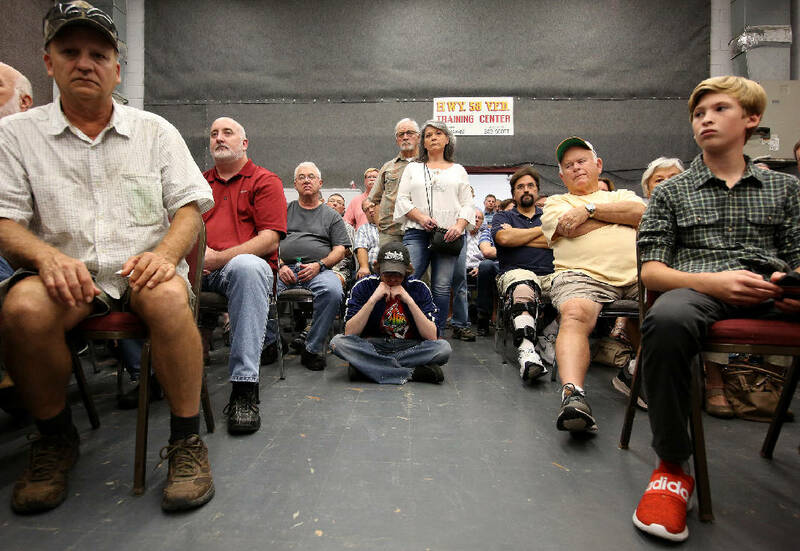 Many spoke heatedly at public meetings about their fears of health impacts, wetlands contamination, sewer stink and loss of value in their most important investments, their homes. Smith reminded the crowd of events since a single yellow rezoning sign appeared on Sept. 28, and how fearful and determined neighbors blew up the phones and social media feeds in opposition. Thursday’s meeting needed to be different, Smith said. “We can use that time to complain about how we don’t want it, but we’ve done that. Let’s use the time to talk about how we can move forward, maybe get some suggestions about what can be done,” he said. Morehouse said representatives from the 14 subdivisions and eight non-subdivided communities are forming committees to tackle tasks ranging from circulating petitions and spreading the word on social media to investigating properties and looking at the law. “WWTA is not moving. This is their site. They’re not backing down,” Morehouse said. The Hamilton County Regional Planning Agency will vote Nov. 12 whether to let the project go forward. Between now and then, he asked the neighbors to smother the planning agency staff, county commissioners and elected representatives with phone calls and emails against the plant. Every person in the crowd got contact information for elected officials all the way up to Tennessee’s senators, as well as the state environmental agency and the WWTA board. Meanwhile, the committees will be coming up with an “accurate, referenced, hard to refute” presentation for the planning agency and, on Dec. 19, the Hamilton County Commission. The WWTA says the site is best because it is low-lying and could make the best use of gravity to collect the waste. Moving it with electric pumps is a much more costly option, WWTA officials said. But they enraged the property owners at Tuesday’s public meeting when they said they had not done any sort of community impact study or calculated the potential loss in property values for the homeowners. “What we’re trying to do is make WWTA look foolish, because in my opinion they are,” Morehouse said. The homeowners also are deeply suspicious because developers sit on the WWTA and planning agency boards. A property owner who was active in an anti-annexation citizens group said he thinks its going to take more than public pressure to stop the sewer plant. Community meeting tonight residents on current activities from various teams. The community is telling WWTA, RPA and County Officials LOUD AND CLEAR – NO to SEWAGE TREATMENT PLANT in Ooltewah. Below are important dates for everyone needs to attend and provide feedback. October 23, 2018: The WWTA hosts a community meeting at Central High School from 5:30 to 7:00 p.m.
October 25, 2018: No Ooltewah Sewage Treatment Plant to host community meeting at Meadowview Baptist Church in Georgetown at 6 p.m.
November 8, 2018: The WWTA to host community meeting at Central High School from 5:30 to 7:00 p.m.
November 12, 2018: The Hamilton County Planning Commission will meet at 1:00 p.m. at the Hamilton County Courthouse at 1:00 p.m.
December 12, 2018: The Hamilton County Commission’s Zoning Committee will meet at the conclusion of its regular meeting. December 19, 2018: The Hamilton County Commission will meet to consider the resolution to provide funding to finance the purchase of property for the North Hamilton Wastewater Treatment Plant. A design engineering firm is engaged to begin conceptual designs for the North Hamilton Wastewater Treatment Plant. March 9, 2018: WWTA met with property owner. May 16, 2018: The Hamilton County WWTA Board approves Resolution 0518-06 to enter into an agreement with S&ME to perform site selection services for the proposed North Hamilton County Wastewater Treatment Plant. The vote is unanimous. September 19, 2018: The WWTA Board is briefed by legal counsel regarding the proposed financial agreement to use funds previously allocated in the budget by the Hamilton County Commission for the purchase of property for the proposed North Hamilton Wastewater Treatment Plant. The board directs legal counsel to submit a resolution for financing the purchase of property for this purpose. September 24, 2018: The WWTA Staff submits request for a Special Exceptions Permit from the Regional Planning Agency. September 26, 2018: The Hamilton County Commission meets for its regularly scheduled Agenda Session. Resolution 1018-14 to finance the purchase of property for the North Hamilton County Wastewater Treatment Plant is an agenda item. October 3, 2018: The Hamilton County Commission denies Resolution 1018-14 to finance the purchase of property for the North Hamilton County Wastewater Treatment Plant. October 11, 2018: The WWTA hosts a community meeting at the Fire Training Center from 5:30 to 7:00 p.m.
October 17, 2018: The WWTA accepts an invitation and provides a presentation to the Ooltewah Council of the Chamber of Commerce at 9:15 a.m. in Cambridge Square above David Wayne’s. October 18, 2018: State Rep. Mike Carter and Hamilton County Commissioner Chester Bankston host a community meeting at Crossroads Baptist Church. Leaked memo from the Home Builders Association and our friends at MAX DENSITY housing PRATT show it’s all about developers pushing sewer plant to line their pockets, throwing current citizens under the bus in Ooltewah. Reap and pillage then move on to another community, no accountability. District 9 Chester Bankston & State Rep Mike Carter are requesting an URGENT community meeting to present ALTERNATE location for the SEWER TREATMENT plant on the NORTH END of the county. They would like everyone to attend to discuss the proposal. Please attend this important meeting and STOP WWTA!